Before you dive in, did you know that we offer a Free Checklist to help you become more musical? You can learn to play by ear, sing in tune, become more musically confident, and more... but first you need to know what your current strengths are and how to focus your efforts. The Musicality Checklist will give you the clarity you need to ensure your training is effective and successful. 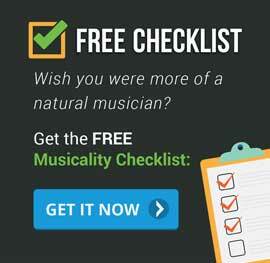 Just click here to get the Musicality Checklist absolutely FREE! Sometimes it seems like all the training material for learning piano is aimed at classical musicians who want to become world-famous concert pianists. But what if you just want to be able to sit down at the keyboard and confidently play a great-sounding improvisation? Or be able to play the songs you hear on the radio by ear, creating interesting arrangements or accompanying a friend as they sing? If you want to be one of those pianists, the kind who seem to play easily and naturally without need for endless sheet music and Hanon exercises, the traditional learning material can leave you a bit frustrated. At Musical U we can help you develop your musical ear for piano so that you can play songs by ear, improvise arrangements with both hands, and really feel like a natural when you sit down at the keyboard. We also have in-depth rhythm training if that’s something you need to improve on. Musical U is a fully flexible training system, meaning there are no fixed courses you have to follow. Instead we support and guide each member to construct their own perfect personalised training plan, using the dozens of training modules provided inside. So whether you want to focus on one of the areas above, some combination of them, or something else entirely, Musical U can support you in reaching your potential on piano. Let’s look at how Musical U can help with each of these two main areas. Have you ever thought it’s strange that despite your technical ability on piano and the advanced pieces you can play, when it comes to playing even the simplest pop song on the radio by ear, you don’t know where to begin? You’re not alone. In fact most pianists (including the most highly trained) find themselves in this situation. Due to the challenging nature of training both your hands and learning to synchronise them, along with reading two staffs of notation at once, most piano learners focus entirely on instrument technique and playing from sheet music for several years, if not their whole piano career. This leaves their musical ear lagging behind, so that skills like playing a song by ear seem almost completely alien. Playing songs by ear on piano is a learnable skill. Once you’ve been playing piano for a year or two you already have all the technical skills you need to play by ear – what you need to fill in is the “inner skills”: the ability to judge note pitches and rhythms by ear and connect that with your fingers on the keyboard and notes on the page. There are two main areas to train for learning to play piano by ear: chords and melody. These generally correspond to the left-hand and right-hand parts for simple arrangements of pop and rock music. The melody of a song is the “tune” and it’s what you’d sing if someone asked you how the song goes. Pianists tend to play the melody with the right hand. We have a Roadmap inside Musical U which leads you from the very basics (no prior knowledge required) through learning to play simple melodies by ear easily on your piano. The chords of a song create its harmony and transform the bare skeleton of a “tune” into an enjoyable arrangement which can take advantage of the entire range of the piano keyboard. At Musical U we provide a full suite of training modules for learning to recognise chords and chord progressions by ear. We use a particular approach which lets you rapidly learn to play a large number of songs by ear, by focusing on the most common chords and patterns. The piano can be an overwhelming instrument at times. With 88 keys and 10 fingers the possibilities are endless, so when you sit down to play without any sheet music it can be very intimidating. So what do you do when a friend asks you to play along as they sing, or someone suggests you play some background music at an event or social gathering? They all know you are “good at piano” so surely you should be able to do those things, right? Again, this is a seemingly-simple skill that is typically not taught to pianists, even at the highest levels of training. Improvising an arrangement, whether it’s completely novel from your imagination or an accompaniment to suit a song you know, is a great skill to have as a pianist and it is something you can learn by training your musical ear. At Musical U we take the mindset that improvising is best thought of as “playing by ear what you hear in your head”. So we teach our members the ear skills they need to imagine new music vividly in their mind and then bring it out on their instrument. Is there a different aspect of piano playing you want to improve on? The beauty of our flexible training system is that you don’t need to neatly fit one of the categories above to benefit from Musical U. We can help guide and support you whatever your particular piano mission might be. Please note that we don’t teach the specifics of instrument technique inside Musical U – we recommend a site like PianoPractice.org or PianoLessonsOnline.com for that. But if what you’re looking for is the “inner skills” of music – to free you up on the keyboard and help you feel like you have an easy, natural, reliable instinct for playing piano – then the chances are we’ve got what you need and we would love to have you join us at Musical U. As a member of Musical U you get immediate access to all Roadmaps and Training Modules, along with a friendly supportive community and expert help whenever you need it. Alex has been playing the piano for several years but has never been able to play songs by ear. His dream is to be able to create and arrange music himself and start performing it for other people. He joined Musical U to help him develop the musical ear needed to compose, improvise and play by ear on piano. And he was keen to improve his singing voice too! With so many exciting goals to pursue, Alex had been feeling a bit scattered and unsure where to focus. At Musical U he came up with a clear plan to follow our “Melodies By Ear” Roadmap for two months to start honing his sense of relative pitch and apply that to playing and improvising melodies. Since then Alex has been methodically working through the training modules and having great success. He’s been using the community inside Musical U to get tips and advice when he feels stuck or needs an extra bit of help, and sharing his own helpful advice there too. His Progress Journal updates show his clear steps forward towards his goal of becoming a musician who can sing, play piano by ear, and freely improvise, compose and arrange to bring his own music into the world for people to enjoy. 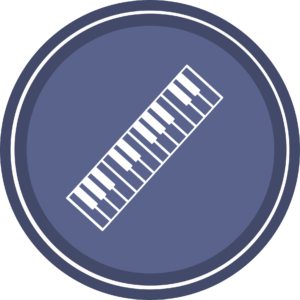 The piano Instrument Pack provides video tutorials and practice MP3s to add instrument-specific guidance to the core musicality training provided at Musical U. Want to develop your own musicality as a pianist? Musical U membership provides you with dozens of training modules, tools for goal-setting and planning, and a friendly, supportive community who will help you succeed. 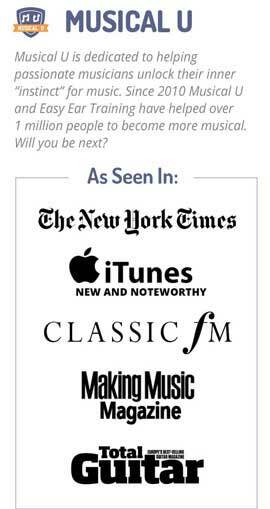 All Musical U memberships are covered by our Total Confidence Guarantee. Already a Musical U member? Click here to log in. © 2019 Easy Ear Training Ltd. / Musical U. Musical U is not a university and does not issue credentials. Discover your current musical strengths and the specific areas you can work on to become a "natural" musician. 100% Secure. We hate SPAM as much as you do. Are you tired of not feeling like a "natural" in music? 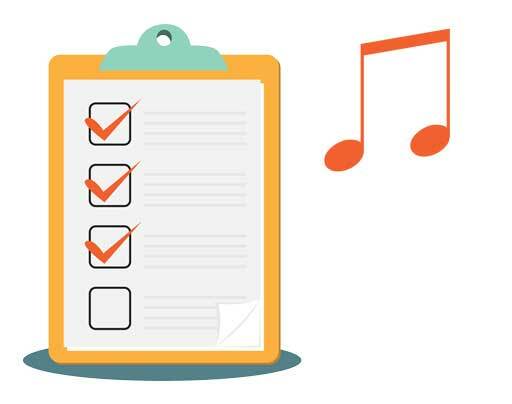 I created a Musicality Checklist for musicians like you. This simple 5-minute exercise could save you literally months of wasted time in your musical training. Just click below to start now! Get your free instant download of the 5-Day Improv Practice Plan now. Contains the step-by-step guidelines to easily begin improvising - TODAY! Perfect to print or keep handy in digital form for reading and quick reference. Get your free instant download of the Big Picture Vision worksheet now! Contains the step-by-step guidelines to easily construct your ideal "Big Picture Vision". 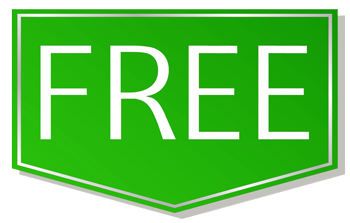 Get your free instant download of the Improve AND Enjoy cheatsheet now! Contains a dozen different ideas to spice up your music practice while keeping it effective.